Should I protect polished porcelain from staining? Polished Porcelain Tiles – Are they maintenance free? LTP recommends that you protect polished porcelain when fitting by applying an impregnating sealer to ensure the best resistance to staining. It is also important to make sure that polished porcelain is regularly maintained to make sure that stain resistance is maintained. At LTP we receive several calls a week about polished porcelain which is often sold as a maintenance free alternative to stone, marble or granite. This is not necessarily true. Regardless of the information that factories offer on this subject, in our experience, 90% of polished porcelain tiles require sealing for one simple reason. The mechanical polishing process used to finish polished porcelain opens up the pores on the surface of the tile. This can lead to maintenance problems and in our view prevention is better than cure so we always advise customers to seal and protect polished porcelain. 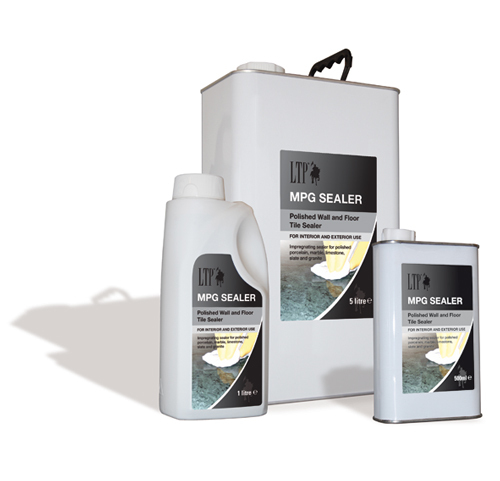 LTP MPG Sealer is an impregnating sealer ideal for polished porcelain. LTP MPG Sealer to protect the tile without altering the polished surface. Some polished porcelain tiles are pre sealed at the factory. This sealing process tends to leave the surface of the porcelain tile smeary and the tile is still vulnerable to staining. The first step is to wash the tile with LTP Grimex or LTP Power Stripper, which removes the original seal. Ensure the surface is dry and that under floor heating is turned off. Then apply a light coat of LTP MPG Sealer to the surface of the tile using a cloth or paint brush and after about 20 minutes use a soft cloth to buff any excess sealer. The buffing is an important part of the sealing process as it encourages the sealer to penetrate all the pores of the porcelain tile and removes any excess sealer from the surface. Leave to dry for two to three hours and re-try the wine, oil and pen tests. Unlike other wax/silicone-based sealers, LTP MPG Sealer is an impregnating sealer so it does not sit on the surface of the tile. Protect the sealed surface from water for 24 hours and do not wash surfaces for at least 3 days. If LTP MPG Sealer is over applied and the surface of the tile has gone smeary, then re apply a little more sealer and buff off the excess. For further information on sealing polished porcelain please download our polished porcelain application guide, (PDF format). Some stains such as marker pen might penetrate the surface of the porcelain tile. It will not however stain the tile as the LTP MPG Sealer below the surface will have absorbed the stain. To remove just apply a little white spirit or LTP Grout Stain Remover. This removes the sealer and the stain with it. To re seal just apply another coat of LTP MPG Sealer to the porcelain tile or area and rebuff. As most stains occur during the fixing stage, we suggest that polished porcelain tiles are pre sealed, especially before grouting as many types of grout, especially dark colours will leave ‘tide mark’ stains along the grout joints. Once the floor is fixed and cleaned off it makes sense to apply a second coat of the sealer to protect polished porcelain fully against household stains. To protect polished porcelain fully there is last point to remember. The use of the incorrect cleaning product will remove the seal from the porcelain tile and cause the tiles to stain. Clean floors sealed with LTP MPG Sealer with LTP Waxwash. Resolving stain issues on polished porcelain can prove difficult. LTP TECHNICAL HELPLINE, so please give us a call on +44 (0) 1823 666213 and we will be happy to help you. Alternatively visit the main LTP site to view our full range of cleaning, sealing and maintenance products for all types of artificial and natural stone. This entry was posted in Maintaining Stone & Tiles, Polished Porcelain, Porcelain and Ceramic Tiles, Sealing Natural stone and Tiles and tagged Grout, LTP, polished porcelain, polished porcelain stains, polished porcelain tile, polished porcelain tiles, Porcelain, Porcelain tile, porcelain tiles, protecting porcelain, Sealing, sealing porcelain, Tile by ltptechnical. Bookmark the permalink.